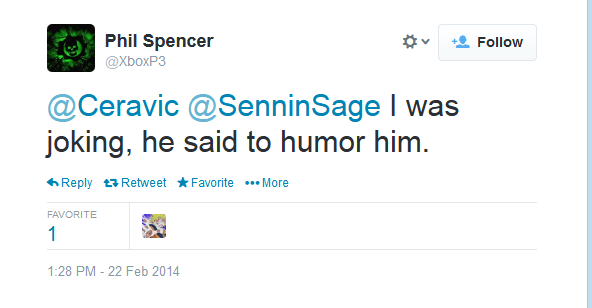 Phil Spencer has confirmed he was joking, after all. It’s all in good fun. Let’s just hope we’ll hear about Sakaguchi’s next game soon. Next-gen could use some solid RPGs, regardless of platform. I think we’ll be announcing these titles once the Xbox One release date draws closer. Blue Dragon and Lost Odyssey on the Xbox 360 were wonderful experiences, and I’m looking forward to forming partnerships with new developers for this system as well. 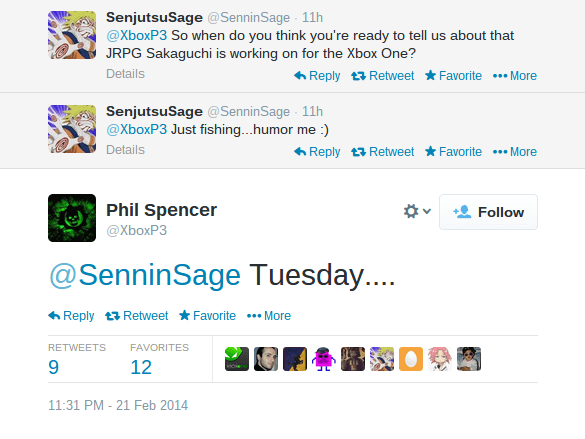 I feel it’s going well, that we’ll be able to respond to the ‘love’ Japan games fans have for Xbox One. In the Neogaf thread and on Twitter fans are speculating that the game could be a sequel to Sakaguchi’s last Microsoft-exclusive Lost Odyssey, or maybe even a second Last Story, though that would be a major loss for Nintendo. Perhaps even more exciting would be the announcement of a brand new series by Mistwalker for next-gen systems. Either way the hinted at date is so close that we won’t have to wait long to find out how true any of this is. So what do you all think? Would you buy an Xbox One for the next game by Sakaguchi?